These socks are perfect for wearing around the house instead of clunky slippers. Of course, if your boots are roomy, these socks are perfect for around town too. 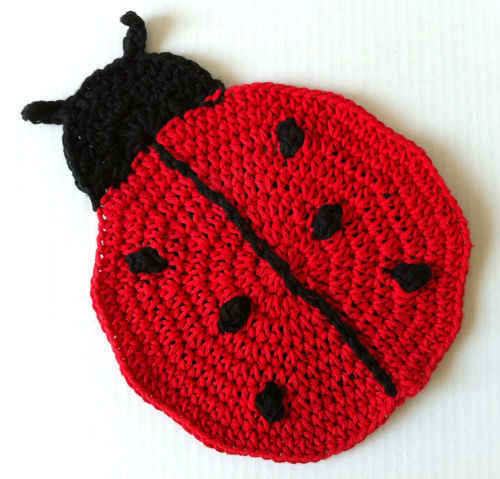 Choose fun colors and crochet them for yourself or as a gift that’s sure to be appreciated. GAUGE: 12 sc = 4″ (10cm) in pattern; 12 sc rows = 4″ (10cm). CHECK YOUR GAUGE. Use any size hook to obtain the gauge. Front Post Double Crochet (FPdc) = Yarn over, insert hook from front to back to front again around the st indicated, [yarn over and draw through 2 loops] twice. 1. To ensure that socks match, work 2 socks at once. 2. Finished socks are smaller than actual fit so that they stretch to stay on the foot. 3. Work in continuous spirals and do not join rounds unless otherwise indicated. 4. Place markers as instructed and move up as each round is completed. With C and smaller hook, ch 5 (7, 9). Round 1: Sc in 2nd ch from hook and in each ch, place marker in last st to mark 1st side; working across opposite side of foundation ch, sc in each ch, place stitch marker of different color in last st to mark 2nd side—8 (12, 16) sc. Rounds 2 and 3: Work 2 sc in first st, sc in each st to sc before 1st marked st, 2 sc in next sc, sc in marked st, 2 sc in next sc, sc in each st to sc before 2nd marked st, 2 sc in next sc, sc in marked st—16 (20, 24) sc. Round 4: Sc in each sc. Rounds 5 and 6: Repeat Rounds 3 and 4; change to A and larger hook at end of Round 6—20 (24, 28) sc. Remove markers; place marker in first st.
Rounds 1 and 2: Sc in each sc; change to B at the end of Round 2. Rounds 3 and 4: Sc in each sc; change to A at the end of Round 2. Rounds 5-20 (24): Repeat Rounds 1-4 four [five] times. Fasten off A at end of Round 20 (24) and remove marker. Rounds 5-20: Repeat Rounds 1-4 four times. Rounds 21 and 22: Repeat Rounds 1 and 2 once. Fasten off B and remove marker. Lay sock so toe is flat at Round 1. On side facing up, place markers at sides of Round 20 (22, 24) so that there are 8 (10, 12) stitches between the markers. Continue working in rows. Row 1 (right side): With right side facing, join C with sc in 1st marked stitch, sc in each st to next marked st, sc in marked st, turn—10 (12, 14) sc. Remove markers. Rows 3-8: Ch 1, sc in each sc to last sc; leave last sc unworked, turn—4 (6, 8) sc at end of Row 8. Row 9: Ch 1, sc in each sc, sc in unworked st in Row 6, working in end of row, slip st in Row 5, turn—5 (7, 9) sc. Row 10: Ch 1, skip slip st, sc in each sc, sc in unworked st in Row 7, working in end of row, slip st in Row 6, turn—6 (8, 10) sc. Row 11: Ch 1, skip slip st, sc in each sc, sc in unworked st in Row 4 working in end of row, slip st in Row 3, turn—7 (9, 11) sc. Row 12: Ch 1, skip slip st, sc in each sc, sc in unworked st in Row 5 working in end of row, slip st in Row 4, turn—8 (10, 12) sc. Row 13: Ch 1, skip slip st, sc in each sc, sc in unworked st in Row 2 working in end of row, slip st in Row 1, turn—9 (11, 13) sc. Row 14: Ch 1, skip slip st, sc in each sc, sc in unworked st in Row 3 working in end of row, slip st in Row 1—10 (12, 14) sc. Fasten off C.
Note: Continue working in spirals, do not join at end of rounds. Round 1: With right side facing, join A (B, A) with sc at edge of heel, sc in next 19 (23, 27) sc around heel and foot—20 (24, 28) sc. Place marker in first st. Round 2: Sc in each sc; change to B (A, B) at end of round. Rounds 3 and 4: Sc in each sc; change to A (B, A). Rounds 5-8 (16): Repeat Rounds 1-4 one [three] time(s); join with slip st in 1st sc at end of Round 8 (16); change to A and smaller hook. Rounds 5-12: Repeat Rounds 1-4 twice; join with slip st in 1st sc at end of Round 12; change to smaller hook. Round 1: Ch 3 (counts as 1st dc here and throughout), dc in each st; join with slip st to top of beginning ch-3. Round 2: Ch 3, FPdc around next dc, *dc in next dc, FPdc around next dc; repeat from * around; join with slip st in 3rd ch of beginning ch-3—10 (12, 14) FPdc and 10 (12, 14) dc. Round 3: Ch 3, FPdc around next FPdc, *dc in next dc, FPdc around next FPdc; repeat from * around; join with slip st in 3rd ch of beginning ch-3—10 (12, 14) FPdc and 10 (12, 14) dc. Weave in all ends. Block if necessary. A, B, C = Color A, Color B, Color C, etc; ch = chain; dc = double crochet; sc = single crochet; st(s) = stitch(es); [ ] = work directions in brackets the number of times specified; * or ** = repeat whatever follows the * or ** as indicated.